(Nanowerk Spotlight) Caenorhabditis elegans (C. elegans), a free-living soil nematode, has become an important experimental model for biomedical research. This nematode has been successfully employed in genetics, ageing research, behavioral assays, drug screening and (nano)toxicology. 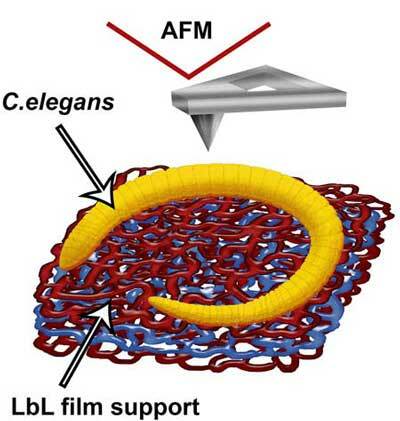 In a new study, researchers report for the first time the effective imaging of the nanoscale structure of C. elegans nematodes' cuticle using atomic force microscopy (AFM) operating in PeakForce Tapping mode. C. elegans nematodes are tiny round worms and their cuticle (their outer covering) is a very important indicator of the animals' well-being. As long as the C. elegans nematodes are extensively used in biomedical research – i.e. drug screening, toxicity testing – quantitative imaging and mechanical properties evaluation will help to diagnose the effects of drugs on nematodes. The team, led by Rawil F. Fakhrullin, professor, Bionanotechnology Group, Institute of Fundamental Medicine and Biology, Kazan Federal University, has published their findings in anomedicine: Nanotechnology, Biology, and Medicine ("Nanoscale imaging and characterization of Caenorhabditis elegans epicuticle using atomic force microscopy"). "We obtained high-resolution atomic force microscopy (AFM) scans both from large areas (i.e. head or tail regions) and from selected cuticle regions clearly demonstrating the periodicity of annular rings typical for C. elegans nematodes," Fakhrullin tells Nanowerk. "Our results indicate that the epicuticle nanostructure may play important roles in nematodes' locomotion and body pressure maintenance. Importantly, we found that the younger larval nematodes exhibit much rougher cuticle surface, apparently to provide better adhesion to wet substrates." The team used PeakForce Tapping non-resonance imaging mode based on the direct measuring of surface topography with simultaneous force curve capturing at each pixel of the scan. They found that PeakForce Tapping mode allows imaging C. elegans nematodes both in air and in their native liquid environment. This method might find applications in the 'worm community' as a powerful tool to elucidate the effects of drugs and toxicants on nematodes by imaging and mechanical mapping of the cuticle. Nanoscale imaging of the nematodes is challenging because the conventional methods based on electron microscopy do not allow imaging the animals in their natural aqueous environments. Nematode cuticle has been previously studied using scanning electron microscopy, which requires that the samples are dehydrated and sputter-coated with a thin metal layer, thus severely compromising the original surface structure. The team's novel approach lifts this limitation. Fakhrullin notes that, until 2015, there were no reports on direct AFM imaging of C. elegans whole animals. "A limited use of soft X-ray contact microscopy allowed fabrication of polymer replicas further analyzed with an atomic force microscope in air in contact mode, yielding in topography images of cuticle and internal organs, i.e. pharynx, hypodermal and neuronal cell nuclei." Very recently, another paper ("Whole-animal mounts of Caenorhabditis elegans for 3D imaging using atomic force microscopy") reported the successful use of tapping mode AFM to visualize whole animal mounts of C. elegans microworms in air. "However," says Fakhrullin, "no quantitative information on the cuticle was reported due to the limitation of tapping mode AFM imaging. Also, the scans of the whole animals reported demonstrate the typical shrunk and collapsed cuticle surfaces characteristic for SEM imaging, which is likely to be caused by dehydration and air imaging. Therefore, we found it challenging to develop a novel method to image C. elegans nematodes both in air and in liquid using PeakForce Tapping AFM mode." The team is now planning to perform similar AFM measurements with live nematodes. This will require new approaches to immobilize living worms on various substrates and to image the live animals in PeakForce Tapping mode. "Also, we expect to visualize and map the mechanical properties and the surface features of live worms at different ages and after treatment with several toxicants," adds Fakhrullin. This method can be employed in screening for anti-nematode chemicals – many nematode species are parasitic, which stimulates the active search of new means of killing them. The scientists' future work will focus on imaging and quantitative nanomechanical characterisation of live nematodes. They anticipate that PeakForce Tapping mode AFM applied to investigate the live nematodes will provide the the scientists in this field with invaluable insights on cuticle structure and the effects of various toxicants onto the nematodes.